Ever wonder if you can move pictures from your cell phone to a computer? There's an inexpensive and easy way to do it. Read on to find out how. So your phone is full of great pictures that you'd love to send to Facebook, print, email or just to save them all in one place. Or maybe your phone's built in memory is full and you can't save any more pictures to. Rest assured there is an easy and inexpensive way to add more photo capacity to your phone and help move them to a PC. Most phones have a slot for a MicroSD or MicroSDHC Memory Card that stores more photos, videos and music than the phone itself will hold. Once you plug the memory card into your phone, it allows you to move your pictures from the phone's memory to the memory card. 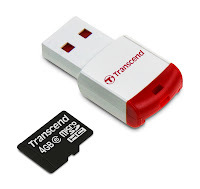 Once the images are stored on the memory card, you can use a USB memory card reader to plug into a computer. USB Memory Card Readers let you simply drag and drop a copy of your pictures from the memory card to a computer folder like any other computer file. This also works with music and videos! $10 for a 4GB card! Other capacities include 8GB, 16GB & even 32GB. To verify which card is compatible with your phone, Contact Us or find your phone model in our Memory Configurator (Memory Finder Tool). If your phone happens to record HD video, be sure to buy a Class 6 or Class 10 memory card. These cards have faster performance required to record HD video onto them. Most excellent article. However, I would make one correction. It says to opt for a 4g SDHC + reader. This is an excellent idea, but what if the camera the consumer has does not have the HC capability. I had a customer yesterday that bought a 4g SDHC card before Christmas. Then discovered all of the pics she took weren't there. She had an older Kodak that didn't use the high capacity chip. I was able to sell her a 2g that made her happy. With todays economy, not everyone is using new cameras, and many are staying with the older models. You've brought up an excellent point regarding SD and SDHC memory card compatibility issues. Many digital cameras and cell phones manufactured before about 2008 were ONLY compatible with SD (Secure Digital) cards, which had a capacity limit of 2GB on a single card. These cameras and phones will not recognize the newer SDHC (Secure Digital High Capacity) cards since the card technology was developed after the devices were. SDHC and MicroSDHC cards were announced in 2006 and are available from a 4GB capacity all the way up to 32GB per card. These, however, may not work in an older camera. The newer cameras will accept either SD or SDHC cards, so keep your old SD cards if you get a new camera. In some cases, the camera manufacturer issued a Firmware Update that allows an older camera to accept the newer SDHC cards. How do you know which card your camera or phone will take? - First, check around the memory card slot for and indication. If it only says "SD" with no mention of "SDHC", it most likely is NOT SDHC compatible. - Try using our Memory Configurator (Finder) Tool at http://memoryconfigurator.theupgradeplace.com . Try finding your phone model and view compatible memory cards for it. - If you're not finding your model, try contacting the phone manufacturer to verify what's compatible. We do carry the older SD (Secure Digital) cards and newer SDHC cards alike and we are happy to help verify compatibility if you call 1-800-338-1531. Most innovative and useful information.Now a days every one will be using their own cell phones .So this is a very informative blog to transfer or copy pictures from cell phone to PC.Here we have used USB card readers to drag and drop files from mobile phones to PC.Thanks for finding time to share all your ideas.